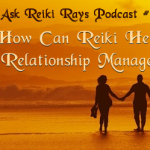 Ask Reiki Rays Podcast #59: How to Use Cord Cutting and Reiki to Disconnect from a Relationship? I would like to find out about cord cutting and how to have the courage to take steps for my freedom. I’ve been in a very miserable relationship for the last twelve years and my husband was an alcoholic, drug addict, womanizer, and a pathological liar. Twelve plus years of this I don’t need it. It’s been two years since he‘s spoken or seen my son. He is living with another woman now and I need to get out of it. I am not finding the energy or the mindset to take action, to basically go to a lawyer and file for a divorce. He is not giving me any kind of a maintenance or anything. How to take legal actions. This is Angie Webster with Reiki Rays. Thank you for your question. You have asked about how to use cord cutting and Reiki to help yourself to disconnect from a relationship. “Cords” refer to the bands of energy that form between us and another person that we are in communication with. When our hearts or brains send out an energy signal to another, that signal is called a cord. When we aren’t emotionally involved with the person, the cord drops away after the communication is over. In our personal relationships, the cords remain and they become thicker and stronger as we bond with the other in various ways. This is also true when we argue and otherwise create negative energy with another. Those communication bonds, or cords, remain as does the negative energy from the emotional pain, unless we are able to release them in a healthy manner. As these store in our systems, they can cause even more difficulties in the relationship and also cause us to continue repeating the same unhealthy relationship patterns, until they are resolved. It’s a good idea to regularly remove cords in your system, just as it is to remove negative energy. Cord cutting won’t remove healthy cords. It will only cut unhealthy relationship cords that you wish to end, when you are ready. It’s a good idea to have a cord cutting performed by another Reiki professional, if possible. We can become too involved in our own problems to fully see all of the blocks that we need help with and another professional can see these more clearly. If that’s not possible, then you can use the release ceremony I wrote about on Reiki Rays, asking Archangel Michael and Archangel Metatron to assist you in removing any cords and negative energy that you are ready to release. You may like to speak to the cord and to the Higher Self of the person the cord is attached to. Let them know you’ll be dissolving the cord at your end and ask if they are willing to also dissolve the cord at their end. Thank the cord for the purposes it has served in the past and ask it to release, with the help of Reiki and Archangel Michael. To boost your intentions to move forward, you can create a plan, writing down all the things you feel you need to do or have in place in your life in order to move forward and be free. Also write down what you would truly like your life to look like; not just the things you don’t want, but all the joys in life that you do want. Be as detailed as you want about how you want life to feel. Hold this list between your hands and send Reiki to it. Do that every day until all the things are achieved. Choose to take the first small step on the list and offer yourself Reiki whenever you feel fear or a lack of strength to move ahead. Write this plan up before you perform the release ceremony and cord cutting, that way it will be in your mind as part of your intentions. It will give you strength to know that you are working toward moving forward. Good luck to you and many blessings.